So Windows 8.1 is finally here and although it is a massive improvement over its predecessor (I recently had to install Windows 8 on a laptop and couldn’t believe how bad it is in comparison), Microsoft’s new Start button really isn’t what a lot of people were hoping for. If you want to enjoy the benefits of the new operating system without being bothered by the Modern UI there are lots of alternative third-party options available. And when I say lots, I mean it. Some cost money, others are free. I’ll list my favorite three and then suggest some others to try if those don’t appeal. Updated to version 4 at the start of October, and offering improved compatibility with Windows 8.1, this is the Start button and menu combo recommended by most, and for good reason. It’s truly excellent. Once installed it will give you a convincing Windows 7 Start menu with all of the features you’d expect to see. If you’re not a fan of the default menu style there are Classic and Two Columns variations on offer. It is packed with options, and the latest build introduces a raft of new features including a dedicated shutdown button, the ability to pin programs directly from Explorer and an enhanced Windows Search function. Although it’s not free, the $4.99 price tag won’t break the bank, and there’s a 30-day trial available so you can take it for a test drive beforehand. The program gives you a Windows 7 style Start menu with Windows 8 enhancements including the ability to pin desktop and Modern UI apps, and support for Jump Lists. It also offers a Windows 8/8.1 style menu which essentially puts the Modern UI (Start or Apps screen) in a pop-up Window. This takes a little getting used to, but actually I quite like it. You can skin the menus, and change the look of the Start button with a custom image. This is a free program that lets you design a personal Start button using your own pictures. It has a customizable menu, tabs that let you quickly switch between Start menu, Start tiles and Recent Documents, and a "Search for programs and documents" box. 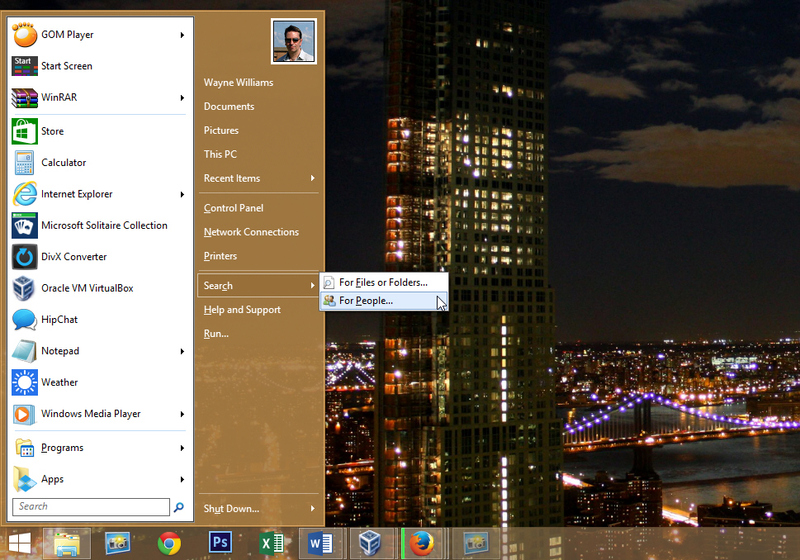 Don’t like the boring old Windows 7 style menu? There’s a cool alternative radial menu you can use instead. If you want extra features you can upgrade to the paid version for $9.99. Please note I haven’t personally tested all of these with Windows 8.1. While they should work fine, I make no promises. If you test one or more out yourself, please let me know in the comments how well (or otherwise) they work with the new OS. 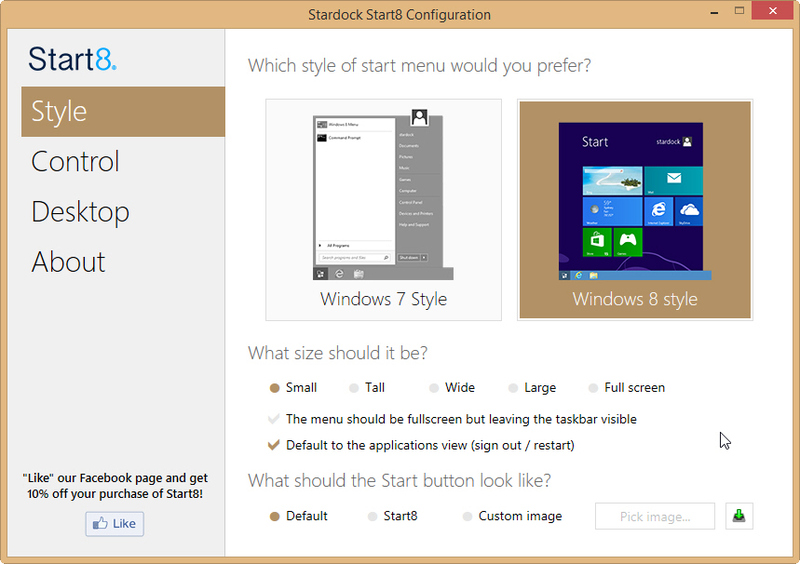 Gives you a real, fully featured Start button and menu that behaves exactly like the one in Windows 7. You get a 30-day trial, after which it will continue to run but in a limited mode. A license for two PCs costs $3, a license for five PCs is $5. 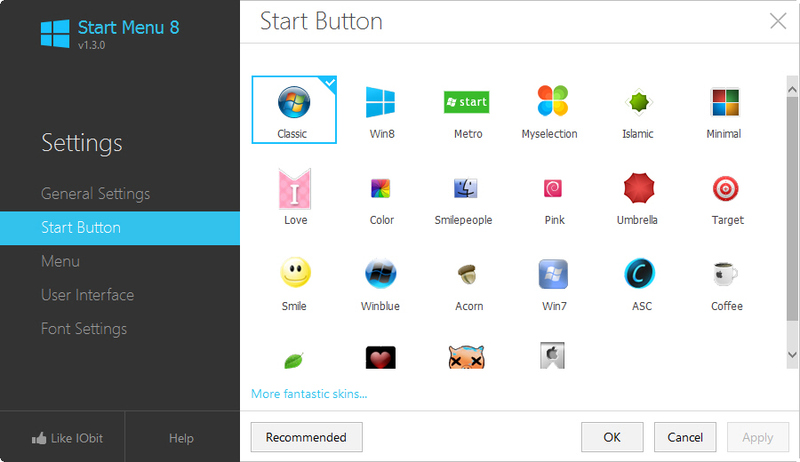 Fully compatible with Windows 8.1, this Start menu is free, although a donation is appreciated. My colleagues at Softwarecrew had some problems with the original build in May, but it was updated in October so should be more reliable now. Adds a Modern-UI styled touchscreen-friendly menu to the OS which you may well hate, depending on how you feel about the tiled interface. A free Windows 7-style Start menu. It works fine with Windows 8.1 and gives you a selection of different Start button choices, including a smiley face, coffee cup, and the standard Windows 7 and Windows 8.1 button designs. 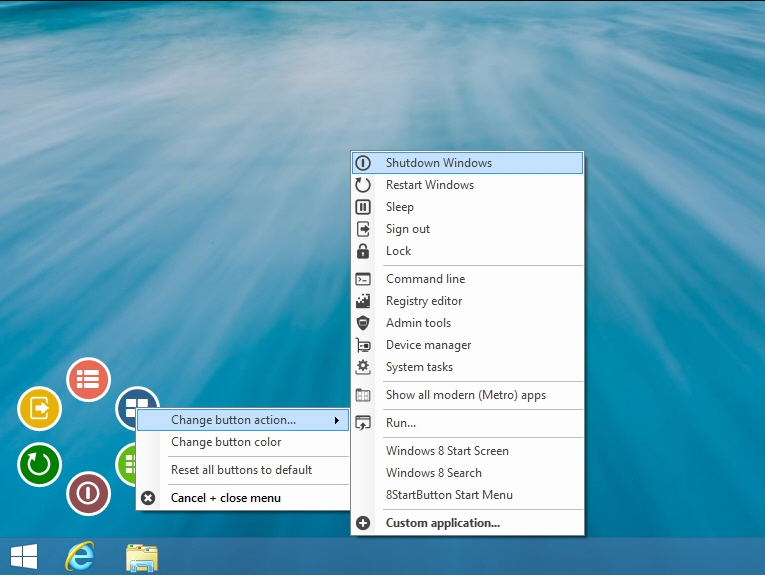 A free Start menu from the developer who has previously created alternative menus for Windows Vista and Windows 7. Compatible with Windows 8.1 this Start menu comes in free and professional editions. The latter costs $9.99. Another free Windows 7 style menu, it offers quick access to the search box, control panel, documents, all programs and more. As well as providing a Start menu, this program gives you a mobile like app experience with tons of free apps on offer.